His business card listed his profession as 'Chief Speedstar', so it seemed entirely natural that Jason Richards was racing a historic touring car at Bathurst just three months before the rare and aggressive form of cancer that he'd been fighting since late 2010 finally claimed him at the age of 35. It says even more about him that the historic touring car outing had been a Plan B. 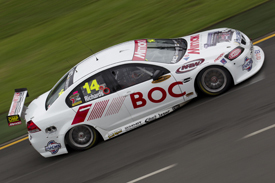 Up until a couple of months earlier, Richards had been hoping to race in the Bathurst 1000 itself as team-mate to Jason Bright in a Brad Jones Racing Holden Commodore, and even went so far as to drive in the practice session at the V8 round at Hidden Valley in June to test his fitness. 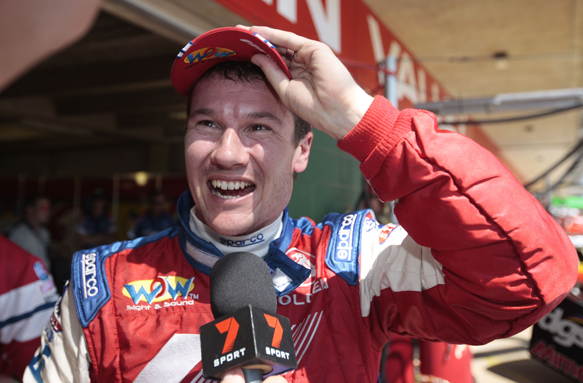 "When I'm in a race car, it makes me feel cancer-free," he told Australian website speedcafe at the time. "Racing around Bathurst [in the historic tourer] will take away a little bit of the pain of not being in the main event." That outing came off the back of an appearance in the Australian Grand Prix-supporting non-championship V8 races in March, where he qualified sixth, took the lead in the pits, but was eventually passed by Garth Tander and finished second. "I had a choice – either to sit on the couch and watch, or take the seat and do it myself," he said. "This is my weekend, where I'm living my normal life. The heavy stuff will come later on." A week earlier, he'd taken part in the second-tier Fujitsu Series race at Adelaide, picking up a win, and also chose the same weekend to make his GT debut in a Ferrari 430 GT3 in the Australian GT Championship races. And all of this just five months after the diagnosis of his illness had forced him to step back from full-time racing. His career numbers don't do his talent justice, but those who knew him rated him highly as a driver, and even more highly as a person. Self-effacing, open, funny, and completely unpretentious, Jason was the sort of person you'd seek out in the paddock even if you didn't have anything in particular that you needed to talk to him about, just because standing around chatting with him for a few minutes made your whole day that bit better. He was also one of the most grounded professional drivers I have ever met. On one occasion we were joking about the perks of his job, when he paused for a moment. "It's actually kind of ridiculous," he said. "For years, I couldn't afford most of the stuff I wanted. And now that I finally can, half of it is being sent to me for free anyway. I feel a bit embarrassed about it." Not so embarrassed that he wouldn't use his status as a V8 Supercar driver to his advantage. I recall being at a friend's house and seeing an interior decoration magazine with a cover story about 'motorsport star Jason Richards' new kitchen'. Next time I saw Jason, I asked him about it. He just winked and grinned. 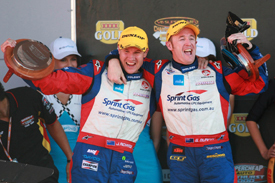 Richards started his V8 Supercar career at Bathurst in 2000 as Angus Fogg's co-driver in the Team Kiwi Holden, and it was largely his prowess around the famous circuit that defined him over the years that followed. He never managed to win Australia's biggest race, but he finished second on three occasions (missing out on the win by just 0.79s in 2009), and fourth in 2007. As well as being his favourite battleground, Bathurst held a personal resonance with Richards, too – he proposed to his wife Charlotte while standing up at Skyline. His only V8 win came at Winton in 2006, three years after he netted his first podium at the Sandown 500 – an achievement that he celebrated by giving a bottle of champagne, complete with specially-made labels, to every member of his team. A multiple champion in New Zealand Touring Cars, Richards spent his entire V8 Supercar career in Holdens. His Bathurst outing with Team Kiwi in 2000 resulted in him being rewarded with a contract for a full-time ride in 2001 and 2002. A stint with newly formed Team Dynamik followed before he moved again in 2004, this time to another new team in the form of Tasman Motorsport. He remained with Tasman for the next five seasons, decamping in 2009. Outside of his own racing he was also passionate about developing motorsport talent in his native New Zealand, and ran a mentoring programme for young drivers. Richards was a gigantically popular figure in the paddock, and the sadness of his loss is tempered only by the gratitude that we had the opportunity to know him in the first place. Our thoughts are with Charlotte and daughters Sienna and Olivia. Australian-born Mark Glendenning joined AUTOSPORT from sister publication Motorsport News in 2008, and left London for California at the start of 2012 to take up his present role as the title's US Editor. Prior to arriving in the UK, he served as deputy editor of Australian magazine Motorsport News for seven years and contributed to AtlasF1 from 1999 and then AUTOSPORT after the websites were merged. Since getting his first media hardcard in 2001 he has worked in a variety of paddocks, including IndyCar, Formula 1, NASCAR, V8 Supercars, GP2, and the WTCC, although he maintains that a one-make Ford Transit race on the Porto street circuit is the weirdest thing he has seen at a track. Currently based in San Francisco, he is still trying to work out how a degree in cultural anthropology got him into motorsport.